Can You Use a Credit Card to Purchase Cryptocurrency? Reports of people making money through cryptocurrencies have many people wanting to get their own piece of the potential. To purchase cryptocurrency, you’ll have to use an exchange — which is essentially a website where you can trade one currency for another currency. For example, you would use an exchange to trade U.S. dollars for Bitcoin, Ripple, or another cryptocurrency that you’re interested in purchasing. If you’ve landed on an exchange that accepts credit cards, you might consider using yours for your purchase. However, using your credit card to purchase cryptocurrency isn’t like using your credit card for a book from the bookstore. It’s riskier and more expensive. Before using your credit card to purchase cryptocurrency — or before purchasing cryptocurrency at all — you should know the potential drawbacks and fees. The cryptocurrency exchange may charge a transaction fee when you use a credit card, or even a debit card, to purchase cryptocurrency. Using ACH (your checking account and routing) takes a few days to post to your account, but it’s usually free. You’ll have to make a choice between fast and expensive, or slow and free. Rushing to buy because you think prices may go up again, may not be the wisest decision. Cryptocurrency exchanges may place a daily or weekly limit on how much cryptocurrency you can purchase with your credit card. If you’ve already met the limit, you’ll have to use another payment source or wait until the limit has reset before using your credit card for additional cryptocurrency purchase. That means you’ll pay a cash advance fee on top of any transaction fee the cryptocurrency exchange charges. The typical cash advance fee on a credit card is either $5 or 10 percent of the amount of the transaction, whichever is greater. So, if you use your credit card to purchase $1,000 of cryptocurrency, you could pay a $100 fee to your credit card issuer. You’ll also be subject to the higher cash advance APR on your credit card and you won’t get a grace period even if you use a credit card with a zero balance. That means you’ll start incurring interest from the day you make the transaction. 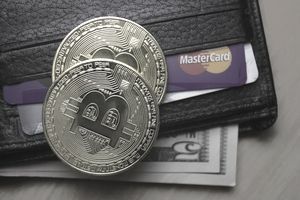 Between the cash advance fee, the higher interest rate, and the lack of a grace period, using a credit card to buy cryptocurrency is much more expensive. It’s just as expensive as if you used your credit card to withdraw cash from an ATM — a transaction that’s generally also a bad idea. Another drawback — no rewards. If your credit card issuer treats the purchase of cryptocurrency as a cash advance, you won’t earn any rewards on the purchase. The purchase also won’t count towards any spending requirements for earning a sign-up bonus on a new credit card. Some cryptocurrency exchanges might be based outside the United States. Using your credit card to purchase cryptocurrency on international exchange could incur a foreign transaction fee if your credit card issuer charges one. Foreign transaction fees are typically 3 percent of the transaction amount. That’s a $30 foreign transaction fee for every $1,000 of cryptocurrency you purchase. It's not a good idea to go into debt to invest or speculate on the value of other currencies. According to a December 2017 survey from LendEDU, 22 percent of active investors who used a credit card to purchase Bitcoin didn’t pay off those purchases right away. They planned to use profits from Bitcoin to pay off the balance. That’s an extremely risky strategy since there’s no way to be sure the value of Bitcoin or any other cryptocurrency will increase. Consider that Bitcoin was at a high of over $19,000 on December 17, 2017, and fell to under $7,000 by the end of March 2018, just three months later. Most experts would advise against using credit cards for any type of investment — cryptocurrency and otherwise. All the top five credit card issuers — Bank of America, JP Morgan Chase, Citigroup, Capital One, and Discover — have all banned the purchase of cryptocurrency. Even if your credit card issuer hasn’t blocked it yet, they could block the purchase at any point in the future. Credit card issuers have varying reasons for blocking the purchase of cryptocurrency. Capital One, for example, made the decision to decline cryptocurrency purchases due to lack of mainstream acceptance and the high risks of fraud, losses, and volatility in the cryptocurrency market. You can check with your credit card issuer to find out whether they’ve blocked cryptocurrency purchases before initiating a transaction. Many cryptocurrency exchanges are scams and prey on people's eagerness to earn a profit. It's important to research thoroughly before you make any cryptocurrency purchases. Of course, credit card fraud protection eliminates your liability for fraudulent purchases made on your credit card. You want to be sure you're not being scammed no matter what payment method you use. Credit utilization — the amount of credit you use — is a major factor in your credit score. The more of your credit you use, the more it affects your credit score. Running up a big credit card balance on cryptocurrency is likely to be damaging to your credit score. It’s even worse if you charge more than you can afford to pay and fall behind on your payments. There's no best way to use a credit card to buy cryptocurrency. If you were hoping to earn rewards on your purchase, they’ll be washed out by transaction and cash advance fees you pay. The lack of a grace period means you’ll have to pay off the purchase immediately to avoid paying interest. The more interest you pay, the less you’ll see in actual profits from your cryptocurrency purchase, assuming you see any profits at all.